Posted in: 1 Pageant Pages, 2 Shout-out-Looks. Tagged: Miss World Philippines 2015. From Great Images Photography comes the official headshots of the Miss World Philippines 2015 candidates. These photos are definitely a far cry from last year’s outputs. But they can still be improved, imo. People are saying that this year’s batch is not as strong as before. Some are stating that, except for a handful among them, the remaining contenders are not as memorable. Be that as it may, I still believe that there are quite a number of really good ones if you just give them a chance to strut their stuff in the flesh and not mere pics. Beyond Hillarie, Emma and Cassy, I can still rattle off more names that can give the three a run for their money. Posted in: 1 Pageant Pages, 2 Shout-out-Looks. Tagged: Ann Lorraine Colis, Miss Globe 2015. 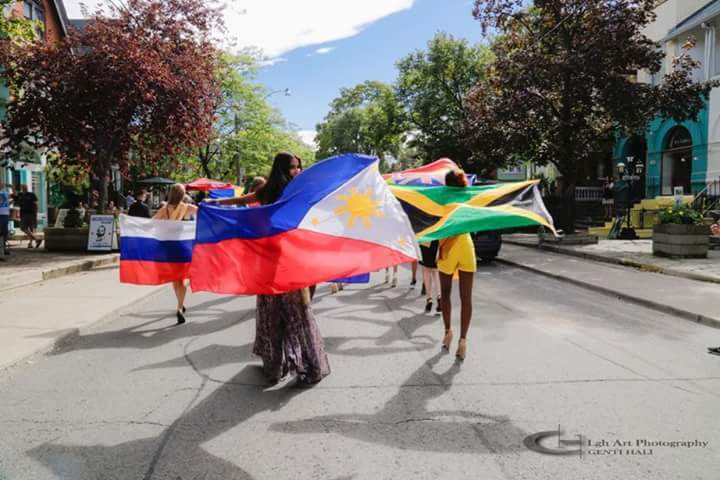 One of the activities of the Miss Globe 2015 candidates is the parade that started from Dundas Square where each one proudly carried their respective flags. And Miss Philippines Ann Lorraine Colis was no exception with her displaying the country’s colors. Some critics might raise eyebrows with the rationale behind the event that could be questioned for the inclusion of the flags. But it’s supposed to show the pride of each participant in the country she represents. Be Mercator’s next Work of Art! Posted in: 1 Pageant Pages, 2 Shout-out-Looks. Tagged: Jonas Gaffud, Mercator Artist & Model Management. 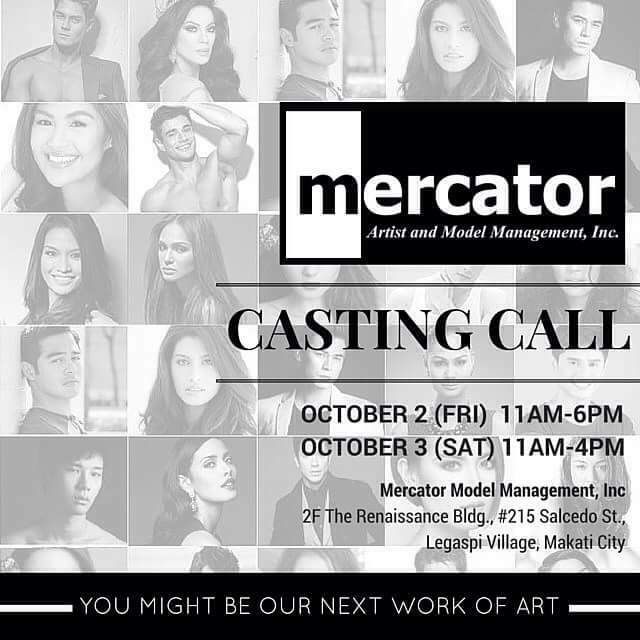 There is an important casting call happening this October 2 and 3 (Friday and Saturday) at the Makati office of Mercator Artist and Model Management. And don’t worry if you’re too young or old, the doors are open to everyone aged 4-65. Now that’s a wide range of applicants to screen, and you will need to really have that indefinable X-factor to get their attention. Do you think you have it in you to become Mercator’s next TV, commercial and movie talent? Now there’s only one way to find out. Posted in: 1 Pageant Pages, 2 Shout-out-Looks. Tagged: Casey Austria, Cassandra Naidas, Christelle Abello, Emma Tiglao, Hillarie Parungao, Janelle Tee, Jeddahliz Maltezo, Mariah Nilo, Mia Howell, Miss World Philippines 2015, Vianca Louise Marcelo. I made a second review of my impressions of the twenty-seven (27) Official Candidates of Miss World Philippines 2015. And I can now basically share a ranked list of ten early favorites. Hillarie Danielle Parungao and Emma Mary Tiglao continue to lead the list. But in my opinion, their positions are not fail-safe because the next two ladies – Cassandra Naidas and Christelle Abello are closing in the gap quite fast. And Mia Howell is also starting to peak with her new styling and make-up. If the finals will be held today, these five should make up the magic quintet. Still, I wouldn’t count the next five ladies out. Jeddahliz Maltezo and Mariah Nilo could be real spoilers. And one of them could potentially switch places with one of the first five in my list. And just to complete the number, I would add Casey Ann Austria, Vianca Louise Marcelo and Janelle Tee. Truthfully, this year’s title could still be anybody’s game at this point, unlike in 2014 when Valerie was a shoo-in for the #1 spot as early as the screenings. Posted in: 1 Pageant Pages, 2 Shout-out-Looks. Tagged: Avonlea Paraiso, Casey Anne Austria, Cassandra Naidas, Christelle Abello, Cory Quirino, Emma Mary Tiglao, Hillarie Danielle Parungao, Ma. Jackielyn Dulay, Mia Allyson Hernandez Howell, Miss World Philippines 2015, Solaire Resort and Casino, Vianca Louise Marcelo. At the Eclipse Lounge of Solaire Resort and Casino earlier in the day, the Twenty-seven (27) Official Candidates of Miss World Philippines 2015 were presented to the Press in their red identical two-piece swimsuits. Each one of them gave their best spotlight turns onstage to win the attention of the media and become early favorites for the competition. Here is a short video of their appearance onstage as a group. Watch now. My ten (10) early picks based on the Press Presentation and named according to their assigned numbers are: 5) Christelle Abello, 6) Janelle Tee, 7) Ma. Jackielyn Dulag, 12) Emma Tiglao, 13) Avonlea Paraiso, 14) Marita Cassandra Naidas, 21) Mia Allyson Howell, 22) Vianca Louise Marcelo, 24) Jeddahliz Maltezo and 27) Hillarie Danielle Parungao. Let’s see if there are potential spoilers in the group. Top of my head right now are: 20) Mariah Nilo and 25) Casey Anne Austria. Miss World Philippines 2015 will be crowned on October 18 at The Theater at Solaire to be telecast over GMA-7 on the same night. Good luck in all your pre-pageant activities, ladies! Posted in: 1 Pageant Pages, 2 Shout-out-Looks. Tagged: Ann Lorraine Colis, Dundas Square, Miss Globe 2015, Rose Theater, Salute Piano Bar. 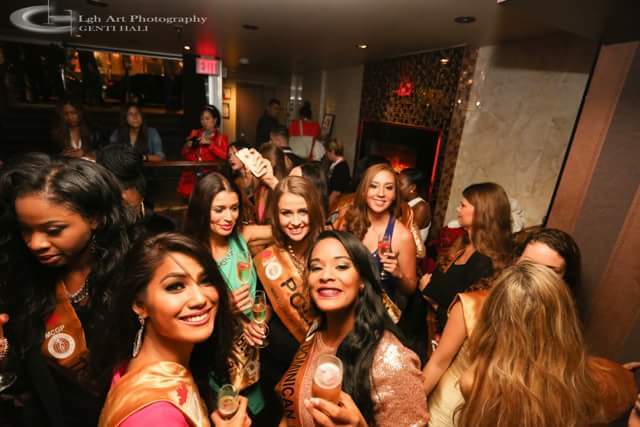 Here are more photos of Miss Philippines Ann Lorraine Colis during the Dundas Square event plus the welcome party of Miss Globe 2015 candidates at the Salute Piano Bar in Toronto. Isn’t she just an easy standout? Anyways, the other purpose of this post is to encourage everyone to keep on supporting our bet in the Miss Globe 2015 Online Voting to help her secure an automatic semifinal slot for the October 8 finals at Rose Theater. Posted in: 2 Shout-out-Looks. Tagged: Bandit, Callum David, Dante Domingo, Impact Manila, Jade Hartman, Jennifer Lee, One Esplanade, Ronan Ferguson, Spectra Electric Carnival, Tom Taus. 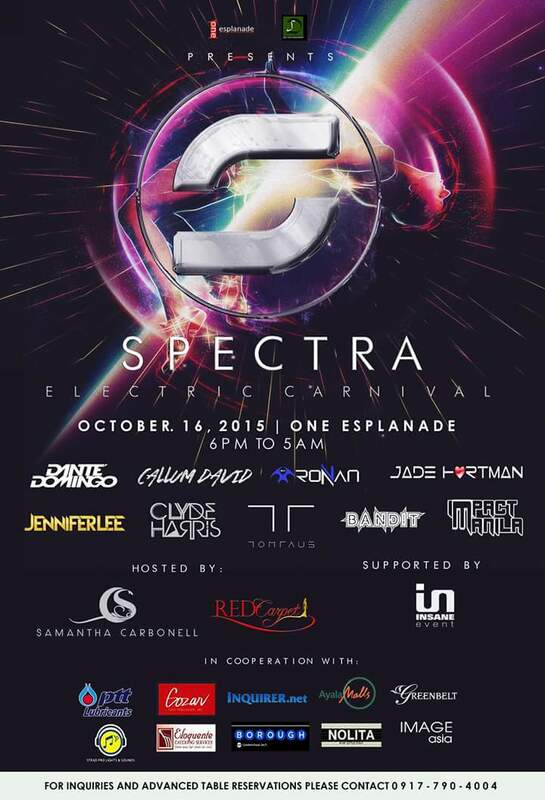 If you love dance & music and performance art, then Spectra: Electric Carnival is for you. 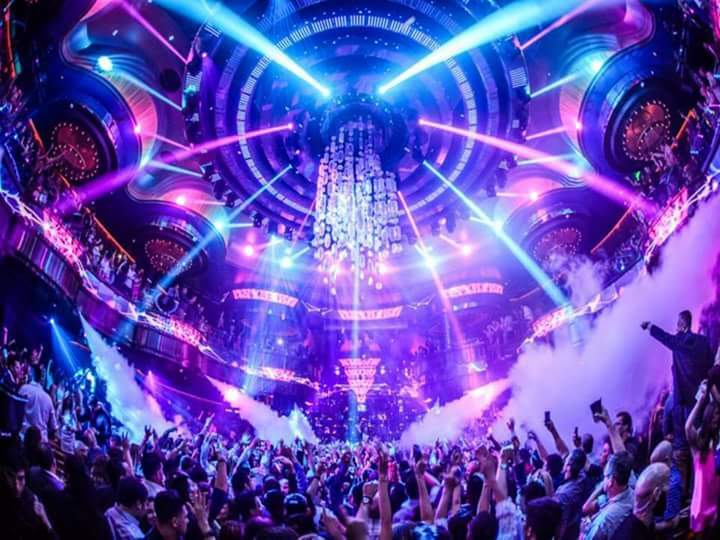 This coming October 16, One Esplanade will be hosting a unique experience in electronic dance music weaved with aerial dancers and performers who are sure to take your breath away in carnival dream proportions. Top DJs will spin their best tracks and the group includes Callum David, Tom Taus, Jennifer Lee, Jade Hartman, Impact Manila, Bandit, Dante Domingo (DgD) and Ronan Ferguson from Ireland. For inquiries and advanced table reservations, please call 0917-7904004. You may also contact these cell numbers: for Quezon City, 09365262093 and for Fort/Makati area, 09152977776. Below is a teaser of Spectra Electric Carnival.